Let’s see a print of a spectacular North American bird. What can you tell me about birds? All living species of birds have feathers and wings and a beak with no teeth and lay hard-shell eggs. Birds range in size from the 2-inch bee hummingbird to the 9-foot ostrich. Most birds fly, but several birds such as penguins do not. Many birds undertake long distance migrations every year. Birds are social: they communicate through calls and songs and come together to breed, hunt, flock and mob predators. Eggs are usually laid in a nest and are incubated by the parents. Colorful songbirds and parrots are popular as pets. Parrots are among the most intelligent animals on earth. Here we have a print called Trumpeter Swan. What do you know about trumpeter swans? Trumpeter swans are on average the largest surviving species of waterfowl on earth. The largest known male trumpeter swan had a wingspan of ten feet! Trumpeter swans are found only within the North American continent. They were nearly driven to extinction in most of the United States in the early 20th century, when they were hunted heavily, both as game and as a source of feathers. Since then they have been protected from hunting and other means of taking, and their populations have rebounded, especially in Canada and Alaska. Perhaps you have seen flocks of trumpeter swans flying in V-shaped formation? Natural populations of trumpeter swans fly in this manner when they migrate to and from the Pacific coast and portions of the United States and the southern tier of Canada. It is fun to watch them feed while swimming, as they upend or dabble to reach submerged aquatic plants beneath the surface. You may be interested to learn that trumpeter swans often mate for life, and that a female trumpeter swan will lay on average 3-12 eggs in her nest sometime between late April and May. Can you guess which animals prey upon the eggs of trumpeter swans? 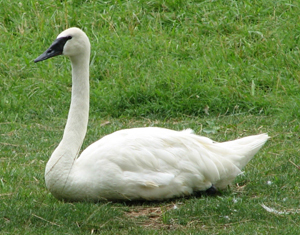 Ravens, raccoons, gray wolves, black and brown bears, coyote and otters prey on the eggs of trumpeter swans. A female trumpeter swan has to constantly be on the lookout for predators so she can protect her young. 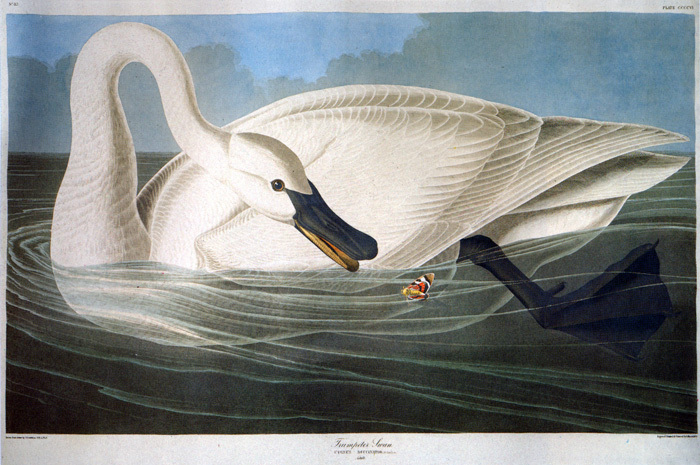 Trumpeter Swan is only one of many prints of birds in John James Audubon’s four-volume, hand-colored The Birds of America. Look closely. 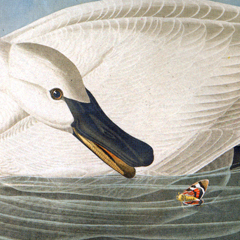 How has Audubon portrayed the trumpeter swan? The swan is swimming in a clear body of water. Its bill is black, and its white feathers are detailed and look downy soft. It may just be me, but the trumpeter swan is so detailed I can almost hear its trumpet-like call! You can tell from this print that Audubon loved birds. From an early age he would spend hours in the woods, often returning with birds’ eggs and nests of which he would make crude drawings. His father, however, wanted him to become a seaman. He sent Audubon away to become a cabin boy when Audubon was only twelve years old. Luckily for those of us who love prints like Trumpeter Swan, Audubon suffered from seasickness and wasn’t fond of navigation. When he failed the officer’s qualification test, he quickly abandoned a naval career. Happily he returned to his interest in birds, passionately exploring fields and woods and filling his room with birds’ eggs, stuffed raccoons and opossums, fish, snakes, and other creatures. The Birds of America was Audubon’s life-long passion. He studied hundreds and hundreds of American bird species and illustrated them in a more realistic way than other artists were doing at the time. What does this mean? What does it mean to be more realistic? First, it means that Audubon recorded birds directly in their natural habitats. Second, it means he portrayed birds as if they were caught in motion—feeding and hunting—instead of in unnatural, rigid poses. Audubon was very ambitious. He traveled on a flat boat down the Ohio and Mississippi rivers to New Orleans and on to the Florida Keys and back through Arkansas. He traveled as far north as Canada and as far west as Texas. He cut quite a figure with his long flowing hair that he slicked back with bear grease. He wore moccasins and a buckskin suit, and he knew many Indian war cries. He also wore a buffalo horn filled with gunpowder, a butcher knife and a tomahawk on his belt. Remember—our country during Audubon’s lifetime (1785-1851) was a frontier, and Audubon was a true frontiersman. Do you wonder how Audubon made his prints? First he took detailed field notes. He positioned birds in natural positions with wire and made a drawing of each bird on a large sheet of paper. He then made a watercolor over the drawing. He sent the watercolors to printmakers in London. Sometimes he didn’t complete all the details but sent instructions. He often added collage to drawings if he wished to add a bird that he had already made, for example. He added oil, pastel, and sometimes a glaze of gum to his watercolors to add more detail. Once in London, the printmakers used a tracing process to make the prints. They engraved or cut the drawings into copper metal plates with a special tool. They also etched drawings into the copper metal plates with acid. The plates were then covered with ink, and papers were pressed against the metal plates and run through a press, and prints or impressions of the drawings were made. Then the prints were hand colored. Each print tells the size, color, behavior and habitat of each bird. So they are more than beautiful, they are scientific documents. They also are big! They are big, because Audubon wanted to paint all the birds life size and show large specimens such as the bald eagle and wild turkey. You may be interested to know that Benjamin Franklin, who was a leader of the American War of Independence (1775-1783) and one of the Founding Fathers of the United States, wanted our national bird to be the wild turkey. But the impressive bald eagle, a bird of prey found in North America, became our national bird instead. 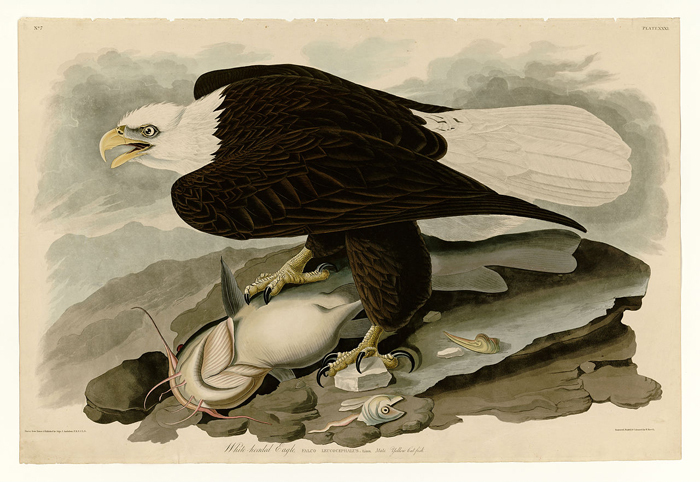 Here is Audubon’s print of the bald eagle. Bald eagles have white heads. For the American colonists who lived many years ago, the bald eagle became a symbol of their courage and perseverance. It reminded them that all men are created equal and that they had certain rights among which were “Life, Liberty, and the pursuit of Happiness.” The bald eagle remains a powerful symbol for us today! Would you like to see The Birds of America in person? All you have to do is visit the North Carolina Museum of Art in Raleigh, North Carolina. The four-volumes of The Birds of America are in the Audubon gallery at the museum. Or perhaps you would like a tour. Tours of the collection are given daily, except for Monday when the museum is closed to the public. If you prefer, you can contact the museum ahead of time and arrange for you and your friends to have a private tour. I’m sure a docent at the museum would be happy to show you and your friends The Birds of America and many other works of art. Whether you visit the museum on your own or have a tour with a docent, it will be well worth your time! This entry was posted in Elementary School, Natural World. Bookmark the permalink.